“The Hike” covers a lot of ground, then brings all its detours together with admirable simplicity and balance. It gives us a glimpse of Schmidt and Cece’s refurbished house, and into the ever-evolving dynamics of their marriage. It showcases Winston’s most bizarre, and most lovable, traits. There’s a pleasing contrast between the bustle of Aly’s surprise party and the seclusion of Jess and Robby’s hike. And like so many of New Girl’s strongest emotional moments, this episode plays out its scenarios with an inevitability that’s both logical and comic, then adds twists that surprise even though they make perfect sense. The biggest question facing New Girl this season was never whether Jess and Nick will get back together, but how to pave the way. Reagan and Robby are more than obstacles on the path to Jess and Nick’s reunion. The writers have made them strong, rounded characters who are well-suited to their partners, assisted by smart, measured performances. That’s especially true of Nelson Franklin, who makes Robby’s cheerful goofiness positively endearing. 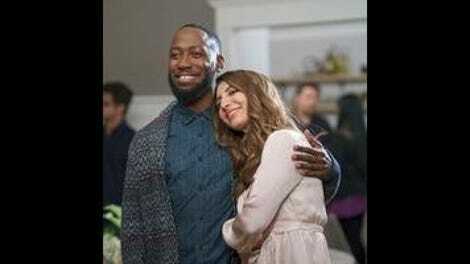 After overcoming the (artificially established) lack of chemistry between them, then removing Jess’ uncharacteristic obliviousness to the fascinating person concealed by his self-effacing affability, it was hard to see what pitfall New Girl writers could put in the path of this relationship between these two adoring, like-minded people. “The Hike” turns Jess and Robby’s sameness—speaking in unison, agreeing on every step of every plan, sharing tastes with eerie uniformity—from a strength to a weakness. Sure, they have the same recipe for trail mix (“homemade, of course!”) to take on their nature hike, but they both pick out the same pieces, leaving just the dusty raisins with no one to finish them. There’s agreement in their relationship, but no balance. So, when the two come to a fork in the trail, they cheerfully agree on the wrong path together. This scene quietly reinforces the disunion between Jess and Robby even as they congratulate themselves on their likemindedness. They stand at the crossroads, smiling, struggling to fold up their maps against the breeze. They’re hiking together, but they’re not together. They’re two people cheerfully taking parallel paths, each using their own guidebook and holding their own map. And that’s before they explore the depth of their, uh, kindred ways. Diverted from their route by the lure of a scenic view (“Why did you let me chase a waterfall? You know what TLC says!”), with Robby’s glasses smashed and Jess’ ankle twisted, the two take refuge from the stormy night in a cave. But it’s not all trail mix, wrong turns, and comical injuries. Jess broaches the subject of whether their similarities are a fault, not an asset, and Robby’s rejoinder—“My great-uncle Shep Wallingford used to say, ‘You buy the horse that you see in the mirror’”—sounds like just the sort of folksy nonsense Jess might espouse… and with good reason. Somewhere between their jaunty rendition of the Wallingford Watch jingle and the discovery that Jess was the pale-skinned, safety-helmeted, imaginary-trombone-playing little boy Robby was partnered with for the three-legged race at his family reunion in ’92, Jess and Robby realize they’re third cousins. It’s a savvy—and irrevocable—way to smash up a relationship that the show has worked to make resilient. Jess’ inkling that their sameness is actually a drawback puts the romance on rocky ground, then the revelation that they’re related plunges the relationship over the cliff. If this is the last we see of Robby, and their bittersweet goodbye suggests that it is, I’ll be sorry to see Nelson Franklin go. Aly’s afraid he’ll run away; instead, he climbs up on the table to give a toast. And you know the rule: A Winston Bishop speech deserves a blockquote. Maybe things didn’t go perfectly, but damn it, don’t be embarrassed to be crazy in front of me, okay? I am the king of crazy. I have inside jokes with my cat. I am a member of The Puzzling Guild Of North America. I shave my face cold and I brush my teeth hot! On one very late and very desperate night, I used Furguson’s catbox as my own box. And yes, it is true, what many of you have heard. I once fell asleep in a bathtub! 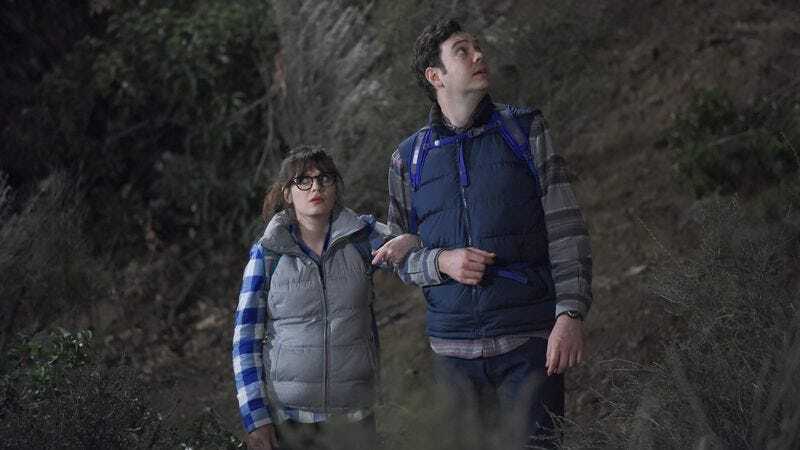 The ease with which “The Hike” extends its action into Cece and Schmidt’s home-to-be suggests confidence in the show’s necessary expansion of its universe. The introduction to the nearly finished house, the central characters’ exploration of the space, and especially the way Cece and Schmidt unite in laying down the house rules establish Jaipur-Aviv as one more place New Girl can call home. How fitting, then, that it’s Nick who opens the door to Jess when she shows up dirty, bedraggled, and alone after her hike. And how fitting that his gusto for her leftover raisins reminds her of the delights to be found in someone whose inclinations complement and challenge her own. It’s a silent gesture to the depth and breadth of their connection. There’s more than one way to come home. After Nick’s advice not to crowd Aly’s parents with hand-kissing and hugs and two-handed shakes, it turns out her dad is a two-hander, too.